It's that time of year again: the tradition-rich holidays! 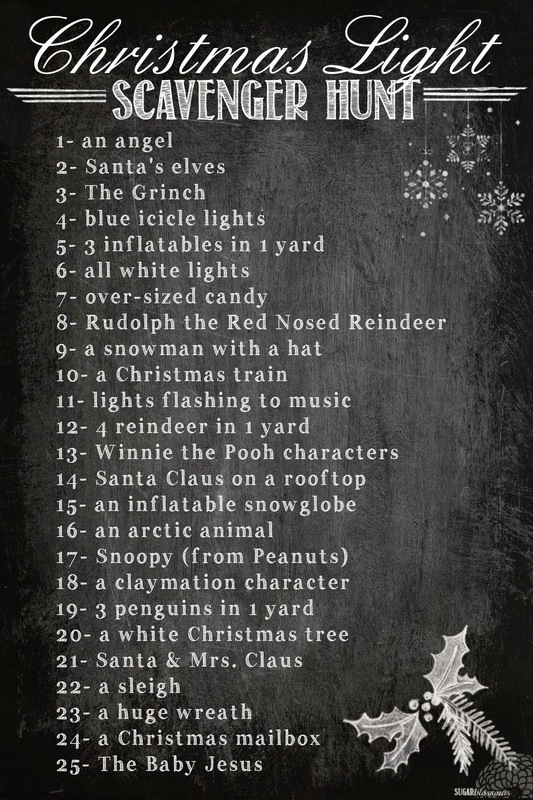 One of our absolute favorites is A Christmas Light Scavenger Hunt. Grab your cameras or cell phones, invite a couple other families, print out a list for each car, split up into separate neighborhoods, set a timer for 30 minutes and GO! Find as many items on the list as you can, take a picture of each one and meet back up with the other families/teams to compare your findings and enjoy some creamy cocoa and pumpkin cookies. This is a game our entire family enjoys! I love seeing what the other "teams" find. I was totally going to make one of these lists! I'm glad you ended up doing it for me. This looks like so much fun. I can't wait to drive around the neighborhood. Great minds, you know! =) I hope your family loves it as much as mine does. Happy Holiday! Awesome! What a great idea to do a walking tour! MERRY CHRISTMAS! Great idea. Love it. We are going to a big park where they have light displays set up and it is all timed to music. Might be fun to play this on the way there and back. Thanks. That sounds so fun! I'm glad you can join in the fun. Merry Christmas! What an awesome idea! How fun:) I love light displays at Christmas. This is so cool! Ahhh! We're going to a Christmas lights show this weekend. Thank you for sharing! Perfect timing! Hope it helps add some fun to your festivities. Merry Christmas! I am going to try and do this with my family on Monday night! Thank you for sharing. It has been so fun being part of this countdown! I am thoroughly enjoying this countdown too! I'm so glad you stopped by. Merry Christmas!